There are four different type of light bulbs: incandescent, halogen, compact fluorescent (CFL) and light emitting diode (LED). Each generates heat along with light, in varying degrees, regardless of the color of the bulb. Halogen and incandescent light bulbs create light from electric current heating a metal filament inside the bulb. Only 10 percent of the energy is used to create light, the other 90 percent becomes heat. This is true whether the bulb is clear or colored glass. 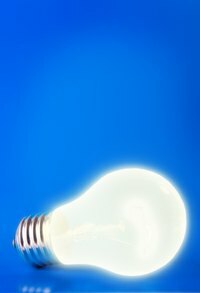 Compact fluorescent light bulbs contain a gas that creates light when electrified. Thirty percent of the energy used to create the light emits heat instead. Again, this is true whether the glass is clear or colored. LEDs generate light when electrons pass through semiconductor material. LEDs generate little heat and are cool to the touch. LEDs come in many colors and the same heat is generated regardless of the color. The white light humans perceive is actually red, green and blue light mixed together. Humans perceive red or yellow as warm light and blue light as cold. Except for LEDs, all colored bulbs are basically white light bulbs with paint applied to the glass to block all but the desired color. Regardless of the bulb color, the same amount of heat is generated as it takes to produce the light. Any colored incandescent bulb will give off the most heat because it is the least efficient.